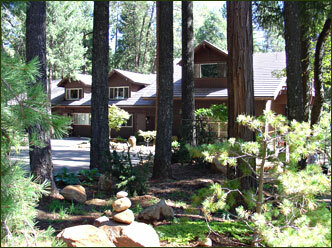 Harmony Ridge Lodge is nestled across Highway 20 on 5 beautifully forested acres adjacent to Tahoe National Forest. A perfect family getaway or business retreat location. The grounds include decks for lounging and star gazing, a barbeque, and fenced acres of wooded gardens for strolling (great for safely exercising your dog). Harmony Ridge Lodge has meeting rooms suitable for retreats, workshops or family events. With the beautiful grounds, Harmony Ridge Lodge has quickly become a popular wedding venue. Contact John for a personal tour of this outstanding property: Retreat, B&B or family compound! 530 265-6565.